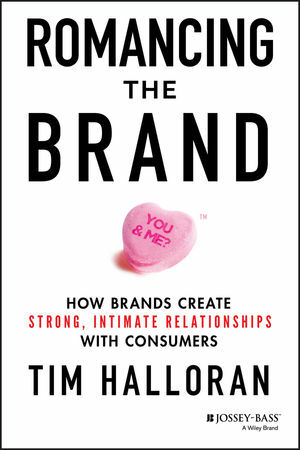 In Romancing the Brand, branding expert Tim Halloran reveals what it takes to make consumers fall in love with your brand. Step by step,he reveals how to start, grow, maintain, and troubleshoot a flourishing relationship between brand and consumer. Along the way, Halloran shares the secrets behind establishing a mutually beneficial “romance.” Drawing on exclusive, in-depth interviews with managers of some of the world’s most iconic brands, Romancing the Brand arms you with an arsenal of classic and emerging marketing tools—such as benefit laddering and word-of-mouth marketing—that make best-in-class brands so successful. The book is filled with examples, strategies, and tools from powerful brands that consumers love, including Coke, Dos Equis, smartwater, the Atlanta Falcons, Domino’s Pizza, Bounty, Turner Classic Movies, and many more. Ultimately, Romancing the Brand provides marketers with a set of principles for making brands strong, resilient, and beloved—and the insight and confidence to use them. TIM HALLORAN is president of Brand Illumination. He has built, directed, and consulted with some of the world's largest brands, at top companies including Coca-Cola, Home Depot, Kraft Foods, Procter & Gamble, Delta Airlines, glacéau (vitaminwater and smartwater), Georgia Pacifi c, the NBA, and Turner Broadcasting System. His successes include the national launch of Powerade sports drink and its sponsorship of the Olympics, codevelopment of Dasani bottled water, and the development of Coke's fi rst Internet marketing initiative. He was awarded Innovator of the Year by Coca-Cola and named Max Award Finalist for Innovation by Georgia State University. He has taught at Emory University and Mercer University, and he lives in Atlanta with his wife and three children.